In the autumn of 1997 I browsed through my copy of O'Neill's Irish minstrels and musicians and noted that in the years between their arrival in New York, 1872, and their deaths in 1892 and 1893, Billy and Charles Taylor were reputed to have made only thirty or so sets of uilleann pipes. Intrigued by this somewhat small number, apparantly no records have survived and the Taylors didn't sign their works, I started to wonder just how many Taylor pipes and chanters have survived to this day. So I set myself the project of attempting to find out. I must add I live in Sweden and had never seen an instrument by the Taylor's in real life before July 1998. However, with the help of the aforementioned Irish minstrels and musicians, some back issues of An Piobaire, and the invaluable assistance of uilleann pipers and pipemakers via the uilleann list, notably Malcolm Sims, Tom Wilsbach, Craig Fischer, Ken McLeod, Pat Sky, Pat Mitchell, Kevin Rietmann, Wally Charm, Eion O'Riabhaigh, Kieron Concannon, John Walsh , Rolf Knüsel, David Quinn & Michael Dooley. 29 sets and 15 chanters have been located so far. I believe the Taylors must have made more than thirty sets. Billy Taylor was said to have been been an excellent piper and the Taylors seemed to have had a passion for experimenting with the uilleann pipes, as regards both construction and the type of materials used. 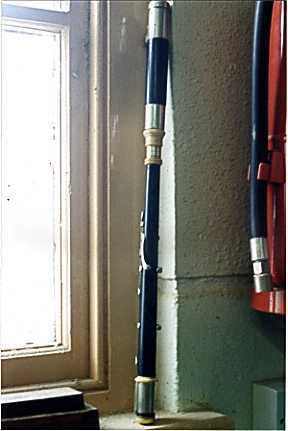 The chanter pictures are of a Taylor chanter I saw in the piping workshop at Miltown Malbay in July 1998. It is in excellent condition and does not seem to have been interferred with in any way. Alan Moller made a sucessful reed, but the only way to get C-natural was by using the C-nat key. The list of Taylor pipes below is not a static list. It's largely a result of questions asked via the internet during the winter of 1997-98 and a visit to Miltown Malbay 1998. Bill Ochs of New York: 1 Taylor set purchased in 1976 previously owned by two collectors and unplayed for many years. Old set of tiny narrow reeds possibly original. Long chanter 14.625 inches (14 and 5/8 in), mellow sound. John Walsh of Canada: 1 Talyor set previously owned in all probability by P.E. McCormack of San Francisco, and later by pipers Paddy O'Neill of San Francisco and his pupil Denis Brooks. Bass drone reed of elder. Mark Hillman owns a 3/4 Taylor set that belonged to Mike Gallagher who died in 1972. Kevin Rietmann: "Mark Hillman's pipes have a chanter with keys in blocks. Mike Gallagher made 2 78 rpm records in the 20's or 30's, one solo, one with chanter and piano backup" This set was for sale in April, 2008 on the Uilleann obsession web site for $16000. "I sent the Taylor chanter to David so he could measure it or whatever. I got the set in the late 80's along with an ivory mounted Rowsome set. Both sets were completely disassembled and in a cardboard box. The woman happily took $400 for both". Anonymous owner of Paddy Fitzpatricks Taylor set. Kevin Rietmann: "The reg. holes on the Fitzpatrick pipes that Standeven gave to his student had sliding holes like the Kildare pipes mentioned by Craig Fischer"
G. F. of Watertown, MA. : 1 Taylor set in excellent condition. Sean McKiernan of Galway: 1 Taylor set that belonged to Patsy Touhey. After Touhey this set was then owned by Michael Carney and then Tom Busby of Fermanagh who emigrated to New York and became a pupil of Carney's. On the 28th of March 1997, Kevin Rietmann wrote: "Tom told me neither he nor Carney ever made new reeds for this set after Touhey died, and that McKiernan was still playing them too. Some of the reeds were by Carney, I'd guess, but others may be original by Taylor, making them prehaps 110 years old. Tom also said Touhey played the same middle regulator reed for 25 years-it probably was busted accidently." Felix Gallagher of Leeds, England: 1 Taylor set with originally four regulators sent to Felix Gallagher 50 years ago by his brother then living in America. The tenor regulator was missing when Felix recieved the set. The chanter has conventional keys in blocks. In bad condition according to Charles Roberts, Sligo pipemaker. This set was for sale in 1997 for 4000 pounds, but is judged to be in need of renovation at a cost of a further 2000 pounds. The set was sold in March/April, 2001 to a piper. Ireland: I Taylor set that belonged to James Early. Kevin Rietmann informs that James Early's pipes were willed to Michael Dunn, the chief of the Fire Dept. of Millwaukee,Wisc. Dunn's daughter owned the pipes afterwards but never played them. Early also willed a Coyne set. Rolf Knüsel of Munich, Germany: Possible early Taylor set made in Ireland before the Taylors emigrated. Found in Ireland. John Pedersen told Rolf that the set is quite similar to the Kerrigan set, which was the first set the Taylors made after they emigrated. The bass, double bass, and original stock made out of rolled sheet metal. The set is believed to have been a left-handed set originally, altered to suit a right-handed player using the original stock. Rolf wrote to me that the set is only 75 cm from the top of the mainstock to the end of the bass drone. Sold to Rolf in 1994? by John Pedersen of U.S.A. An article about this set appeared in An Piobaire, III, March 25, 1996. Ireland: 1 Taylor style set, made in all probability by Anderson, in the National Museum in Dublin. Four regulators, with one (bass?) regulator playing only the E. Pipemaker Johnny Burke only made one Taylor copy, and modelled it on the the Taylor set owned by Michael Dooley. Michael informed me that photos were taken of the Dublin museum set during a one day visit in 1975, but the detailed measurements were taken from his set. The Burke Taylor style set is owned by piper Joe Doyle of Blackrock, Co. Dublin. John Hughes of Ireland: 1 Taylor boxwood chanter, two keys. Kevin Rietmann writes that: "Hughes' chanter also has block mounts. The notes are strange, C-natural and high D."
Christy O'Leary of Edinburgh & �rebro, Sweden? : 1 Taylor set that belonged to Mike Hanafin (probably William F. Hanafin's pipes) who died before 1920 of influenza. The set was passed on to O'Leary by a relative of Hanafin. John Walsh wrote: This set still had the original reeds and the drone reeds were made of elder - Alain Froment commented that the chanter reeds were halfway between the old flat-set reeds and the modern ones, narrower staples like the old ones, blades more like modern ones. Ted Anderson of San Francisco: 1 Taylor set, double bass regulator and a straight bass regulator bar, and 1 double chanter originally owned by John Cummings of San Francisco? From Kevin Rietmann: "Ted Anderson's single chanter also has these keys in block mounts (C-natural and high D). It was said to be Patsy Touhey's spare; Touhey presented it to Cummings in 1915 when he was in San Francisco for the Pan American Exhibition". A Dan Sullivan of Co. Cork who lived in San Francisco is also believed to have owned this set. These pipes were acquired from Seattle piper Bill Heaton for the sum of 1300 dollars a number of years ago. Ted Anderson wrote on the C&F Uilleann forum thread: "Pipes in the closet" 25th August, 2003 "Ivan Donaldson was a fisheries biologist at the Bonneville dam and lived in Stevenson since the late 30's. He ordered and got a concert set from Leo Rowsome in the 50's. He did not learn to play it and it showed signs of work by M. Kennedy of Cork. Sean Folsom, and most west coast pipers, tried to obtain the set from Ivan. After I had bought the Prof. John Cummings Taylor set from Bill Heaton, (who had gotten them from Dan Sullivan), I contacted Ivan about the Rowsome set. He had seen the Taylor set during a visit by Bill Heaton and was keen to have them. He explained that he had a terminal illness and had only a year or so to live.I worked out a trade with him that gave me the Rowsome set and enough money for a Wm. Rowsome set which was available from Denny Hall. I was given the option to buy back the Taylor set after Ivan passed away. Meanwhile he ordered a C set from Geoff Wooff, a musette and a set of smallpipes from John Addison, to pass on to his son. These were later sold, after Ivan passed, and I got the Taylor set back. The Wm. Rowsome went back to Denny, who sorely missed it. I sold the Leo R. set to Tom Creegan, who claimed right of first refusal, as Rolf Kunsell in Switzerland had offered considerably more from the set than I ended up selling it for to Tommy. I still have the Taylor set. Kevin R. told me about the double chanter and parts which I bought. The double chanter went to Mark Walstrom, and the boxwood Coyne 5 note barit. reg. went elsewhere. I still have the fruit wood 5 note baritone reg. and the drone bits. Thus ends this saga of UP trades in modern times on the west coast of the USA, at least the ones Kevin R. knows about. There are others as well." J. B. of Peekskill N.Y.: 1 Taylor set owned. The bottom of the bass drone was built by Michael Carney. Barry O'Neill of New Haven, Conn. U.S.A.: 1 Taylor set. Kevin Rietmann wrote that this set has tenor and baritone regulators with double bores and reeds like Sean Folsom's set. Vancouver, Canada: 1 Taylor set owned by a former student of Tomas Standeven. Standeven passed on the set together with another chanter (Taylor?) but kept the original ivory chanter. Tomas Standeven U.S.A.: 1 Taylor chanter made of ivory. This chanter is fully keyed with padded keys covering even the fingerholes that would normally be open. Gregg M. of Boston, Mass.. 1 Taylor chanter in it's original box with believed regulator reed. Brought in 1997 very cheaply. A music store in Boston acquired a box of odds and ends including this Taylor chanter. Thought to be a strange kind of flute, Gregg was notified, and purchased it. Michael Dow of York, ME, U.S.A.has tried to trace the rest of the set through the name and address of the original owner found with box. Descendents were found, but not the rest of the pipes yet. 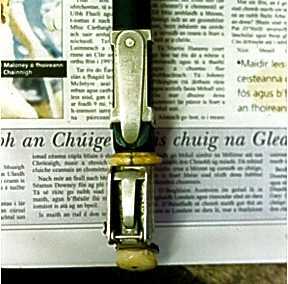 This chanter is in very good condition and was reeded after much effort by Alan Moller at Milltown Malbay in July 1998. The chanter is very like the chanter belonging to Rolk Knüsel's set. Taylor chanter in the piping workshop at Miltown during Willie Week 1998. Waiting to be reeded by Alan Moller. It took Alan two days (he worked on other chanters too) to get a satisfactory reed tuned to this chanter. They could only get C-natural by using the key. Gregg mentioned that a reed was in the Taylor's box when found, supposedly a regulator reed. Maybe it was an original chanter reed. 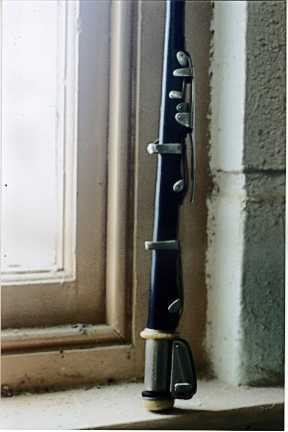 This chanter is owned by Gregg M. of Boston Mass. Mercer Museum in Doylestown, U.S.A.: I Taylor set and pipemaking tools in the Mercer museum. When the Taylor's passed away their pipemaking equipment was taken care of by Robert Hutton, who in turn sold the tools and other equipment, including a set of pipes, to a collector, Henry Mercer of Doylestown, Pennsylvania. The set of pipes were sold to Henry Mercer for the sum of $124. This set belonged to William Taylor and was sold to Robert Hutton, a pipemaker, by Charles Taylor. Two photos of the set by Sara Good with information about the set by Carol Jones can be found on pages 24-25 of An Píobaire, vol. 10, no. 5 Nollaig/December 2014. Kevin Henry, U.S.A.: 1 C-flat Taylor chanter. Henry says the Taylors made only five C-flat chanters. 1 possible Taylor double chanter (nickel silver, silver?). Passed on to Henry by Pat Hennelly. Kevin Henry says the chanter was originally made for a Chicago politician. Edinburgh, Scotland: 1 C-flat Taylor chanter in museum. Patrick O'Leary's grandson of Adelaide, Australia: 1 Taylor set taken to Ireland in the 1970's to be renovated, but has never been seen since? This Taylor set was played during the 1930's in Melbourne, Victoria, by Patrick O'Learys uncle. O'Leary was a correspondent of Francis O'Neill and emigrated from Ireland to America and Australia. Total 29 sets plus 8 chanters in D, 1 chanter in C, 2 C-flat chanters, and 6 double chanters. Any information about Taylor pipes, their owners and their whereabouts will be gladly received and included here.